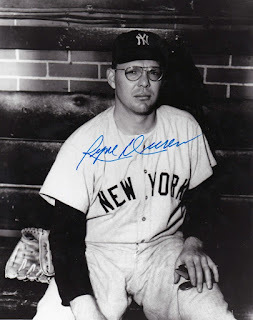 Famous for his Coke-bottle glasses and his blazing fastball, Ryne Duren was an integral part of the 1958 World Series champion New York Yankees and a three-time All-Star. He passed away Thursday at his home in Lake Wales, Florida at the age of 81. Duren was signed by the St. Louis Browns in 1949 and made his debut as a September call-up in 1954 when the franchise moved to Baltimore. He spent the next two seasons in the minor leagues perfecting his repertoire. It is during that time in the Pacific Coast League with Vancouver where Duren's legend grew. Hollywood Stars and future Pittsburgh Pirates hurler Cholly Naranjo remembered the reluctance his teammates showed to face Duren on a bitterly cold Opening Day in 1956. "In 1956 we had opening day up in Vancouver and it was cold man," Naranjo recalled. "Duren was the starting pitcher. The guys from our ball club didn't even want to go up to hit. That son of a gun used to throw so hard with those thick glasses. Everybody got back in the clubhouse to get close to the heaters, nobody wanted to go to hit." Stories have been told of Duren being so wild that he threw warmup pitches off of the backstop. Others thought it was to make sure batters never got a strong toehold in the box. Johnny Romano, who later became an All-Star for the Cleveland Indians, was Duren's catcher in Vancouver. He felt that Duren knew exactly what he was doing with his occasional spells of wildness. Romano told how Duren silenced the Pacific Coast League's top power hitter Steve Bilko with a temporary loss of control. "I just came from Double-A and went up to Vancouver. I never caught a guy that could throw so hard at that particular time," Romano recalled. "I remember that season the home run king was Steve Bilko. Steve was hitting the ball constantly against us when we played in Vancouver. He came up this one time while Duren was pitching. When he faced Ryne, he was standing back one-and-a-half to two feet from the plate because he was afraid he was going to get hit. The way he was hitting, he was probably going to go down. The first pitch pushed him back off the plate and after the third pitch, he must have been back three feet from the plate. He didn't want nothing to do with Ryne. Then Ryne threw three strikes down the middle. Steve didn't flinch. They couldn't say he was wild. He was known to be a wild pitcher, but he wasn't wild if he could throw three straight down the middle." In 2003, Duren along with the president of the non-profit organization Winning Beyond Winning, Tom Sabellico, authored, "I Can See Clearly Now" a memoir about his baseball career, struggles with alcoholism, and life after baseball. Sabellico established an enduring relationship with Duren that went far beyond baseball. "I met Ryne about 13 years ago and he was as big in person as I remember him as a kid, watching him hop over that bullpen fence," Sabellico said. "He had the attitude that he could get the job done. He became a big speaker for Winning Beyond Winning. His life experiences, his openness, his willingness to share with kids and any youth group was just extraordinary." Sabellico discovered the power that Duren's story had on the fans he met while traveling with him. He found that Duren left an indelible mark on those he encountered. "After we wrote the book, he used it as a tool in his speaking with groups," he said. "When we went on these tours and met people, I'll never forget the faces of these people and the expressions when they thanked him for having either saved their lives or their loved ones. It was extraordinary how many people knew his story no matter where we went, whether it be Wisconsin, Florida, or Pennsylvania. The people, as soon as they would see him, would thank him. Whether through his clinic in Wisconsin or his talks, one day at a time, he helped to save them." Duren had urged Sabellico to help him with the book because of how proud he was of what he did after his struggles with alcoholism. Sabellico discussed Duren's impetus for writing his second work. "He became much prouder later in life," he said. "That's why he wanted the book written of what he accomplished off the field rather than on the field because he felt that he screwed up a bit with the alcoholism when he was on the field and he could have been so much better. He was given a second chance and was able to accomplish much more. His first memoir, "The Comeback," Robert Drury wrote in 1978 and he felt he had accomplished a lot since that time. He wanted me to get that out, not only to retell his story but to add what happened since the first book. He told me, 'I like the way you write, I want to give you the opportunity to rewrite this story.' I spent a lot of time with him in Florida and researched it. What he really wanted to get out was, not just the baseball part of it, but the education part of it. He wasn't anti-alcohol, he was pro-education; he wanted people to understand what it was about and how it affected them. You not only needed to treat the person but the people around the person so they would understand the addiction." Duren's passing left Sabellico with unforgettable memories of a man who turned his life around to help others. He touched the author in the same way he did those who struggled with substance abuse. "He was a powerful no-nonsense guy," Sabellico said. "He had been to the bottom. He tried to commit suicide a few times and when he spoke about it, he was serious and could affect people's lives. I'll tell you my life was affected by him; I'll never forget him."